Did the Obama-Putin Encounter Help Ease the Ukraine Crisis? Leaders in Western Europe clearly want the problem to go away, but the United States is pressing Europe to step up military spending. There are mixed signals aplenty between the United States and Russia, but it appears that various Western European leaders are doing their part to bring President Obama and President Vladimir Putin together and to avoid, at least, the worst possible outcome in the Ukraine crisis. Perhaps the best hope for finally ending the crisis will come when Putin realizes that his overreaching on Ukraine has had the unfortunate byproduct of strengthening and reinvigorating NATO, giving the United States new ammunition to demand that the Europeans increase their military spending. President Obama’s new talk of putting additional NATO troops in Eastern Europe—already rejected by Slovakia and the Czech Republic—and creating a $1 billion fund for military reinforcement in the region, is not a good sign for Europe and for future US-Russian relations. Both leaders “have spoken for a prompt end to bloodshed in southeast Ukraine as well as for an end to military actions from both sides—from the side of the Ukrainian armed forces and the supporters of federalization of Ukraine,” said Putin’s press secretary, Dmitry Peskov. Despite that there was no separate meeting [scheduled], the leaders of the two states had an opportunity to share their views on the situation in Ukraine as well as on crisis in the east of the country. 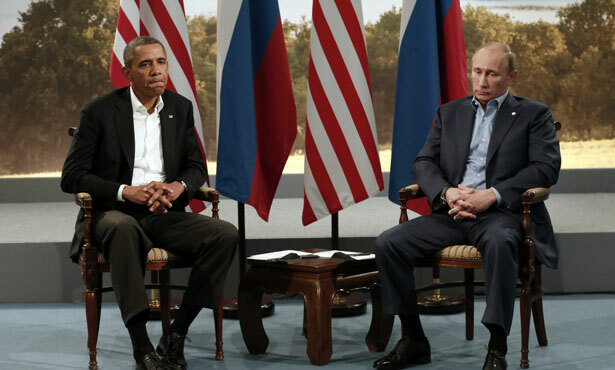 Putin and Obama have spoken for the necessity to reduce violence and military actions. The Washington Post, which has its own propaganda value but which is closer to actual journalism than RT, reported that “the United States, Russia and Ukraine took small steps to ease tensions.” Earlier, before Obama and Putin talked briefly, the Post reported on the G-7 meeting by saying in its lead that “President Obama and other leaders meeting here offered an olive branch to Russian President Vladimir Putin,” and adding, “It was clear that the international big chill imposed on Moscow over its actions in Ukraine is starting to thaw.” But is it? Despite recent, apparently conciliatory actions by Putin, very, very serious problems remain. Earlier on Thursday, Mr. Hollande joined Mr. Obama, along with the leaders of five other major powers, in condemning Mr. Putin’s annexation of Crimea. But France, like other European nations, has economic reasons to maintain cordial relations with Russia. Despite explicit opposition from the United States, France remains on track to deliver two advanced warships to Russia in the coming years. Russia continues to have a responsibility to convince them to end their violence, lay down their weapons and enter into a dialogue with the Ukrainian government.… On the other hand, if Russia’s provocations continue, it’s clear from our discussions here that the G-7 nations are ready to impose additional costs on Russia.… We will have a chance to see what Mr. Putin does over the next two, three, four weeks, and if he remains on the current course, then we’ve already indicated what kinds of actions that we’re prepared to take. Despite Obama’s missteps, however, things could be a lot worse. Obama didn’t really set a deadline for anything, since he didn’t say what has to happen in “the next two, three, four weeks,” and in any case it will be difficult to impossible to get Western Europe to impose harsh economic sanctions on Russia. (Russia, after all, isn’t North Korea or Iran.) And so far at least Obama has resisted pleas from American hawks and from the government of Ukraine to supply Kiev with military aid. During his meeting with Poroshenko, Obama did the least possible, given the political circumstances surrounding their much-anticipated meeting, agreeing to provide Ukraine a piddling $5 million worth of “night-vision goggles” and other “nonlethal equipment.” It would appear, from all indications, that Obama is trying not to inflame the situation, whose resolution depends now on whether Putin and Poroshenko, the latter backed by the United States and Europe, can arrive at some amicable way to forget about Crimea and to set up a limited version of autonomy in Ukraine’s east.